Monday was a holiday in Canada as well as it was in the United States which meant there was plenty of New York Ranger and New York Islander prospect action going on. The star was once again Adam Tambellini as the 2013 3rd round pick continues to pile up the points as he had a 4 point game (1-3-4) against the Red Deer Rebels. Adam Tambellini's (NYR 2013 3rd) play over the last couple of months makes one wonder where he would be had he started the season in the WHL. 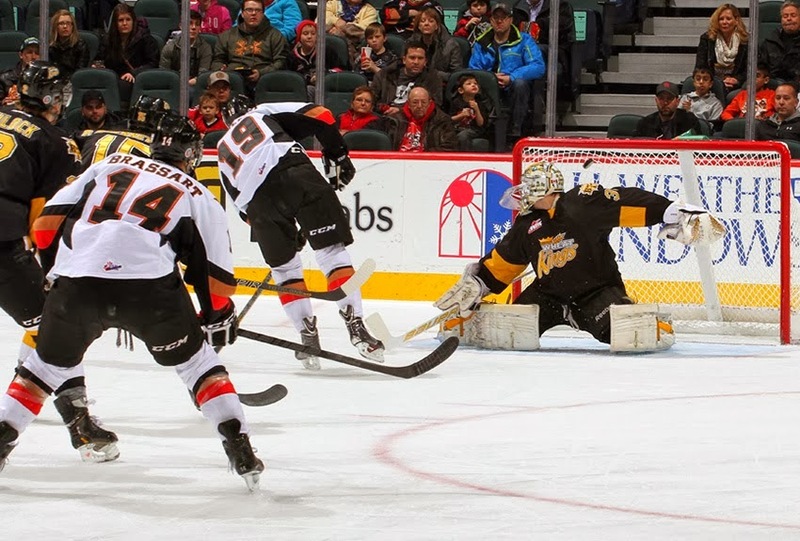 The Calgary Hitmen were looking to keep pace with the Edmonton Oil Kings as the 2 teams are fighting for the lead in the WHL's Eastern Conference. Tambellini's play as of late is a huge reason why the Hitmen won their 7th straight game 7-1 over Red Deer. Tambellini got his day off with a secondary assist on Calgary's first goal of the game which was a power play goal just 4:28 into the first period and Calgary never looked back. Tambellini scored his 13th goal when he scored on the power play at 16:54 of the first period on a goal that would prove to be the game winner giving Calgary a 2-0 lead. In the 3rd period Tambellini would add a primary and a secondary assist to earn his 2nd four point game of the season. Both goals were power play goals giving the game's 3rd star 4 power play points and a rather nice 9-9-18 on the power play for Tambellini who's value is going up with each passing game. Overall Tambellini is 13-14-27 in 19 games. Kyle Burroughs (NYI 2013 7th) of the Regina Pats led his team up against Ryan Pulock's (NYI 2013 1st) Brandon Wheat Kings as the two teams are fighting for the WHL's East Division lead and the 2nd seed in the WHL's Eastern Conference playoff that goes with it. Neither player scored for their respective team as Burrough's Regina Pats earned a 4-0 win which gives them a 2 point lead over Swift Current and a 4 point lead over Brandon in the division race. Regina is unbeaten in their last 5 games while Brandon is headed in the opposite direction winless in their last 6 games. Loic Leduc (NYI 2012 4th) registered his 5th goal of the season as his Rimouski Oceanic shut out the Victoriaville Tigre 5-0. For Leduc the goal which was Rimouski's 3rd of the game gives him a new career high in both goals and points at 5-7-12. The win was Rimouski's 5th straight and moves them into 4th place overall in the QMJHL past the Quebec Remparts with a game in hand. Troy Donnay (NYR 2013 UFA) was scoreless, a -3 with 3 different minor penalties while Adam Pelech (NYI 2012 3rd) was just scoreless as their Erie Otters were spanked 6-3 by the KItchener Rangers. The Otters are trying to stay with the Guelph Storm in the race for the best record in the OHL. This loss hurt the Otters as Guelph whipped on Victor Crus Rydberg (NYI 2013 5th) and his Plymouth Whalers 9-3. Crus Rydberg had a secondary assist for this 22nd assist and 30th overall point but the point came long after the outcome of this game had long been decided. Finally Griffin Reinhart (NYI 2012 1st) missed his 3rd straight game as his Edmonton Oil Kings crushed the Lethbridge Hurricanes 12-0.